LAARS Boilers are one the top boilers in the hydronic boiler industry. The company is a subsidiary of Bradford White, which is a company with great products and a great reputation for high performance and high quality boilers. With heating costs almost certain to rise why not heat your home more effectively and more efficiently than ever before. Why spend hundreds of dollars each month on heating bills when you don’t have to. 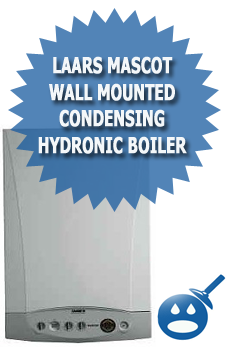 LAARS has a boiler inventory that will surely have a boiler that best suits your home. One of these boilers is the Endurance Residential Hydronic Boiler. The Endurance Series offers high efficiency non-condensing boilers that work with or without a domestic hot water system. When you purchase this boiler you will have 2 boilers to choose from. The first model is the 110 and it modulates from 61,800 BTU’s per hour to 108,200 BTU’s per hour. The second is model 175; it modulates from 102,900 BTU’s per hour to 175,300 BTU’s per hour. Each model has 3 different boilers. Each has an AFUE rating of 85% or slightly better. You can use either Natural Gas or Propane. These boilers are tested at the factory at 60 P.S.I. They have a working pressure of 30 P.S.I water. Since these boilers are compact, you have more flexibility of where you want to install them. They have a built in pump and an internal by-pass system. This LAARS boiler offers low NOx levels of less than 25ppm and a high efficiency of 85%. The benefits of the Endurance Residential Hydronic Boiler is that they provide your home with natural and even hot. This means that you will no longer have cold spots in your home. This will help you save money on your heating bills. The boiler has a self-monitoring system that includes an advanced microprocessor that will ensure a great operation and a reliable performance from your boiler. The system also has a diagnostic system that is designed to let you know when even the slightest problems arise, thereby saving you money. If you know there is a problem, you can take care of it before it becomes a larger one. The boilers offer a 20-gallon tank on each boiler and includes a premium heat exchanger and a low limit control for maximum operation. You will want to read carefully the installation manuals before installation. There are clearances and recommendations from LAARS that you need to follow. They also recommend that you hire a qualified technician to install your Endurance Boiler. LAARS offers a 20-year limited warranty on the Endurance Boiler Series, which is one of the best in the industry. They also have a 100% satisfaction guaranteed program. 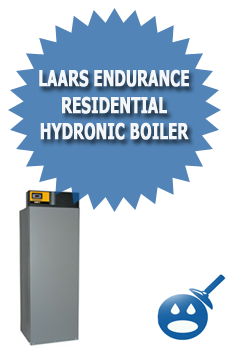 If you are looking to purchase a LAARS Endurance Boiler contact them via phone or email. Check out their website for more information. We have a LAARS endurance boiler system in a 7 year old home. Brand new. Heating company in Sudbury, ontario Charbonneau out of business. 5 year warranty up. We have had nothing but problems with this furnace and 2,000.00 later with many parts changed nobody is the wiser and can tell us what is wrong. Can you help us. Desperate! We have a LAARS Endurance boiler furnace too. It was installed in 2004, and ever since it seemed like every other week the technician was here fixing something or other! Now it’s 2010, system is approx. 5 1/2 years old and still having problems without explanation. We did have the company repair problems for the first 5 years for free, but now that warranty is up, we are paying and I anticipate paying quite a bit more with expectations of many other problems occurring. The system cost approx. $14,000 including the in floor system, duct work, forced air unit for the upstairs, operating from the boiler too. I am beginning to think we have been taken to the cleaners, with all of the inconveniences we’ve experienced. Cold water when hot was required. No heat upstairs because of air blocks, oh…so many air blocks. Parts needing to be replaced even knowing this unit is under 5 years old! Now, in 2010, I can’t even get the company to return any phone calls? I also have a Laars endurance. 3 years old. One day the water went cold in the shower. what i did was push the top left button to turn it off then pushed the same button to turn it back on. And wow i had hot water. so i think thats how you clear the codes. So give it a try… good luck. Amtrol – Extrol MOdel#30 tank for hydronic heating. HELP~!!!! NEW IN 2004. WHY NOT?? I use this laars endurance boiler from last couple of years. It’s really provide us a great service from the earlier age of this boiler. It’s only possible for a great maintenance of this boiler. I check my boiler at least one time in a week. And when I find any kind of difficulties I repair this . That’s why this boiler provide us this long service.